A legend of the Science Fiction world, Harry Harrison has written numerous books including Bill, The Galactic Hero (series), and Make Room! Make Room! which was the basis for the film Soylent Green. His most well known books, The Stainless Steel Rat, recently saw the first new addition to the series in 10 years. After I inquired if he would be interested in writing a review of his latest book, The Stainless Steel Rat Returns, he responded not just with a review but several short reviews like the quotes one finds on the cover of books. All in different characters. First though, a synopsis of the book. James Bolivar "Slippery Jim" DiGriz, Special Corps agent, master con man, interstellar criminal (retired), is living high on the hog on the planet of Moolaplenty when a long-lost cousin and a shipful of swine arrive to drain his bank account and send him and his lovely wife, Angelina, wandering the stars on the wildest journey since Gulliver's Travels. old. Rush out and buy--2 copies of more. the dust bin. Do best to avoid. for those near and dear to you. Not that funny...or adventurous...or unputdownable.. I'd like to thank Harry Harrison for taking the time and participating. Also I'd like to thank Paul Tomlinson who maintains Harry's blog and website. You can learn more about Harry Harrison by checking out his site and blog. I would also like to say that while I provided links to his latest book, I love the series and would recommend to anyone looking for some fun SF to start at the beginning and read the whole series. "oozing damp turd" ... I can't shake the image. So this is the Harry Harrison you told me about? I knew nothing about him before this (I considered that he might just be one of your imaginary friends), but now I'm intrigued. Thanks for the introduction. I'm probably the only person reading your blog who actually read Make Room! Make Room! (when it first came out). Based on your post, I'm gonna check him out again...thanks! DUDE!!!! Hilarious one line reviews. You got to add those to your ongoing series. I love, love, oversexed teen and jealous SF. Very funny one line reviews, for sure! I haven't heard of any of these books, either. Are you sure you grew up in Canada? I have read a Stainless Steel Rat book. I quite liked it and it is strange I haven't read the others. Aha! I'm flying this Saturday - I'll be heading to half price books to look for the first in this series. Awesome that you got a personal favorite author for your blog. That is very cool of you to think to try, and cool that he participated. 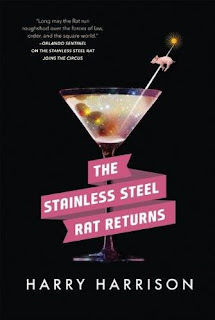 I've read four or five of the Stainless Steel Rat books (I think the last one I read was a prequel, when he was a teen). They're all very good, and I wish there was a way to translate them into a movie, but unfortunately the aspects that make Jim DiGriz such a great character are really hard to put across, as it's mostly his internal dialogue and quick witted skills at getting in and out of danger that define him. I also read the version drawn in the UK '2000AD' comic. How did I miss that this was coming out?!? Can't wait to read it. Going to order right NOW. Haven't read of his stuff, but you've intrigued me now!